Fleabane is disliked as a weed in the field. The flower looks like the helianthus and the mum and however, is beautiful. It is distributed on a nationwide scale now though it is a naturalized plant of a North American origin. The country of origin is a naturalized plant in North America. It is distributed on a nationwide scale. The plant length is about 40-80cm. The elongate leaf has gone out of the stalk. It branches on the grass, and the flower of white or the pale purple blooms from the early summer to autumn. The petal is very thin though the flower looks like the helianthus and the mum well. A yellow part at the center of the flower is called a tubulous flower. The one seen a petal the flower peripheral is a ligulate flower. 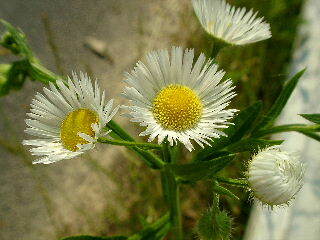 It is Fleabane of the weed in the field of summer. I am embarrassed because it grows even if it takes or it takes it though the flower is beautiful. It is anywhere in the roadside. There is Philadelphia fleabane in the flower that looks alike well. Fleabane face upes while do the face down of this at the bud. It is usual that Fleabane is taller than Philadelphia fleabane. The flower of Fleabane is smaller and more than that of Philadelphia fleabane. Moreover, do the face down of the bud of Philadelphia fleabane though the bud of Fleabane face upes. When the stalk is broken, it is understood not to understand. The inside is blocked in the stalk of Fleabane. I understand at once because there is a cave on the stalk of Philadelphia fleabane. And, the leaf of Philadelphia fleabane has adhered like holding the stalk though the leaf of Fleabane doesn't hold the stalk.